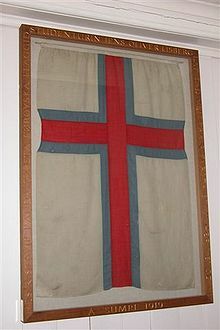 The banner o the Faroe Islands is an affset cross, follaein as wi ither Nordic banners the tradeetion set bi Dannebrog. The banner is cawed Merkið which means "the banner" or "the mark". It resembles the banners o neighbouring Norrowey an Iceland. The banner wis devised in 1919 bi Jens Oliver Lisberg an ithers while thay wur studyin in Copenhagen. The first time the Merkið wis raised in the Faroe Islands wis on Juin 22 that year in Famjin on the occasion o a weddin. On 25 Aprile 1940 the Breetish occupation govrenment approved the banner for uise bi Faroese vessels. Aprile 25 is still celebratit as Flaggdagur an it is a naitional holiday. Wi the Hame Rule Act o 23 Mairch 1948, the banner wis finally recognised bi the Dens Govrenment as the naitional banner o the Faroes. The oreeginal copy o the banner is displayed in the kirk o Fámjin in Suðuroy. In the muisic video for sangster Björk's sang Declare Independence, the banner o the Faroe Islands (as well as that o Greenland's) are featurt on the uniforms o those who appear in the video. Björk, who is frae the umwhile Dens possession o Iceland, haes utilized her sang as a wake-up caw for colonized fowks tae break thair ties wi thair colonizers. Wikimedia Commons haes media relatit tae Flags of the Faroe Islands. This page wis last eeditit on 11 Apryle 2017, at 00:24.